It seems crazy to me now, but I was brought up with the idea that feeding dogs was a simple matter requiring a bag of kibble and a bowl. They really have us fooled. I mean how could I believe it made sense that people require such a wide variety of foods & nutrients while dogs need only highly processed piles of kibble? I’ve learned a lot since then and I feel it’s really important to get the word out there about canine nutrition. Because it seems the vets aren’t doing this job. 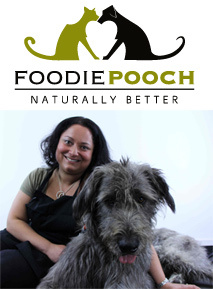 So I was pretty happy last week when I got to speak with Alla Keogh, a small animal nutritionist who has started producing a healthier canine food. (By the way, my picky Pluto sampled her new cuisine yesterday and loved it!) This article on canine nutrition is contributed by Alla. Is there such a thing as the perfect dog food? 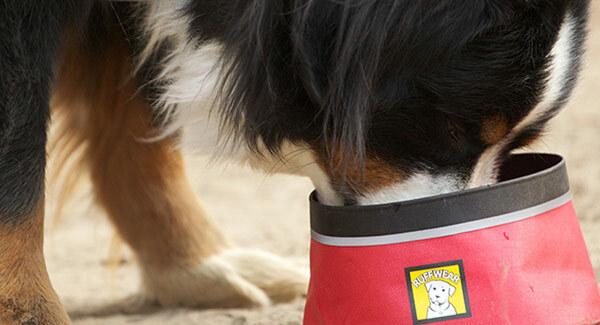 As loving pet parents, we all want to feed our pooches as well as we possibly can. For many of us, that means feeding them as closely as possible to their natural, ancestral or species-appropriate diet. However even the most committed of us admit that there are challenges in doing so. Cost, insufficient freezer space, concerns about nutritional imbalances in badly designed homemade diets, or difficulties in finding appropriate ingredients and lack of accessible pre-prepared raw meals are driving pet owners to look for more practical, convenient options. Processing of these foods occurs at high temperatures and destroys the natural nutrients in the food. Many commercial pet foods use by-products and waste from the human food industry. These include meat meal and by-products such as skin, hooves, snouts, fur and feathers that come from the 4 “D”s – the Dead, Dying, Diseased or Disabled animals. Poor quality proteins are very difficult to digest, and cause unnecessary stress to the kidney, liver and metabolism in general. The majority of commercial pet foods contain vast quantities of grain, as cheap filler and alternate source of protein that is a poor substitute for real meat in a carnivore’s diet. This is a problem particularly as an animal ages, and the quality of their protein becomes critical. There has been a significant shift in the pet food market towards “human-grade” and “grain-free” kibbles. Is this the answer pet owners have been looking for? I’m afraid not. And this is why. Firstly, we know that healthy, natural, whole foods are “live” foods. They spoil easily if their conditions are not ideal. But highly processed foods, such as kibble, maintain their taste, texture and appearance even once the bag is opened. Often for months. Sometimes for years. Secondly, their lack of moisture means that they lack an essential property for healthy metabolic balance. By examining the canine ancestral diet, we can clearly see that our dogs are designed to consume and digest foods containing high levels of moisture. Raw foods and living prey contain about 70% moisture. A lack of moisture in foods forces our dogs’ bodies to work extra hard to provide sufficient moisture to reconstitute the food in the digestive tract. Whilst it may appear that a dog is thriving on a kibble diet, over their lifetime, health issues will start to emerge. These are generally not immediately linked back to poor diet, but research (not to mention common sense) suggests that the top reasons pets visit the vet – such as chronic ear infections, hotspots and skin problems, dental issues and digestive/gut problems – are all diet related. Species-appropriate raw food – This is a raw, grain-free diet of muscle meat, bones, organs, vegetables and fruits. In that order. That means no corn, wheat, rice, soy or oats. The food is in its true biological form. Meats are on the bone, or in pieces, chunks or minced. Vegetables and fruit are blitzed in a food processor. The whole meal is raw, whole and unadulterated. It is the very best thing you can feed to your pet. It’s high in moisture, bursting with natural vitamins, antioxidants, minerals and amino acids, and it’s fresh, the way nature intended. Home Cooked – The next best thing to raw, fresh food is a well-considered, nutritionally appropriate home-made, gently cooked or steamed meal. It is very lightly processed, so the nutrients in the food are still largely intact. The diet will take into account all the nutritional requirements of the animal and will be part of an overall healthy diet that achieves “balance over time”. This diet should also include raw meaty bones which offer essential nutrients and promote dental health. If you’re unsure of what this should include, there are many good books on the subject, or you can consult a Small Animal Nutritionist to help you put together a diet plan. Minimally Processed – Next come minimally processed, convenient, commercially available foods such as dehydrated or freeze-dried. These are foods that are either raw or have been steamed to remove pathogens, and naturally preserved using either warm air or water. These foods need to be reconstituted with water prior to serving. The difference between dehydrated or freeze dried foods and kibble is that no matter how “premium” that kibble is, it is processed in exactly the same way. All kibble is cooked, and extruded (pushed out) at high temperatures to achieve the shelf life and shape required. Foods processed in this way retain very little of their nutritional value. When air dried or freeze dried foods are reconstituted with water prior to feeding, they also become moisture rich and significantly healthier than any dry food on the market. At the end of the day, there is no one perfect food for your pet. By choosing a natural diet of human-grade, high quality meats, organs, vegetables and fruits complemented by raw meaty bones, low-lactose dairy products such as yoghurt, kefir or cheese and foods high in Omega 3, 6 and 9 essential fatty acids such as chia seeds, sardines and salmon, you will ensure your furry friend has a long, happy and healthy life free of the lifestyle issues associated with consuming heavily processed, mass-produced pet food. July 20, 2013 | Filed under Canine Health. 2 Responses to Is Kibble The Ideal Food For Your Dog? Think Again. Thanks for this great article. I’m a health-junkie and I’m getting my puppy in 2 weeks. This article has helped me in a great way to learn about healthy dog food. All the best to you and your pack!